Back in April, I introduced you to a new company called Everything But The House (EBTH), who's mission is to take the thrill of estate sale shopping online. "One man's trash is another man's treasure" is a motto I have always ascribed to. There's nothing more thrilling than finding an amazing treasure at a great price at a yard sale/garage sale/estate sale. Everything But the House (EBTH) is a revolutionary online estate and consignment sale company that combines the personal touch of a local business with the convenience and reach of a global e-commerce company. EBTH aims to make browsing and bidding on items easy, convenient and fun. They present items with crisp, high-quality photography and detailed descriptions written by subject matter experts. Items are grouped together by sale, but can also be searched by location (“Dallas”), category (“artwork”) or keyword (“lamp”). They have two amazing local sales that I wanted to share with you because ladies and gentleman, there are some STEALS AND DEALS to be found here! The great thing about shopping a local sale on EBTH is that you have the option to pick up your purchases in person and save money on shipping. If you are buying a piece of furniture, this can save you hundreds of dollars! The first sale is from a Darling Homes model house in Prosper which means that all of the items purchased for this home were just for show and they have minimal wear and tear. This sale ends Sunday, August 9th 2015 at 7:00pm and items purchased will need to be picked up on August 11 (between 2-7pm) at 4350 Wilson Creek Trail, Prosper, TX 75078. A lot wooden hangers. The hangers come in a maple or ebony finish. Current bid is 1.00. This may seem like a random selection, but do you know how expensive these hangars are!? A Legacy billiards table. This pool table has a tan top with an oak base and dark tan leather pockets. The table has a Legacy maker’s mark on the top and on each of the pockets. The table sits on large tapered legs. Billiard balls and rack are included. Current bid is $7. Retail value is $1399. A patio furniture set. The set includes one loveseat, one chair, and two tables. All of the pieces are made of a dark gray colored metal and the cushions are covered with a blue fabric. Current bid is $22.00. The second sale is from another model home in Star Creek in Allen. This sale ends Monday, August 10th at 7:00pm and items won will have to be picked up on Wednesday, August 12th from 2:00pm to 7:00pm at 2111 Garden Brook Way, Allen, TX 75013. 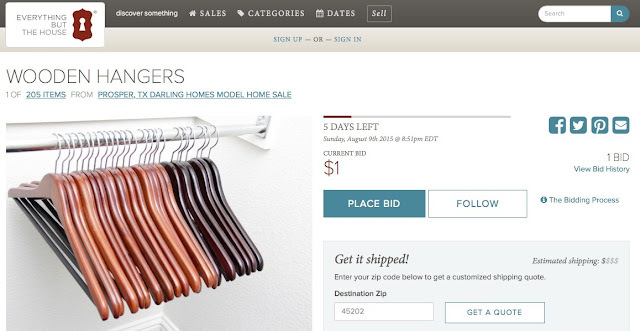 Bidders can “Follow” items they like to monitor the bidding action. As sales wind down, last-minute bids add 5 additional minutes to the clock to give everyone a fair shot (similar to a live auction). With 100+ sales a month and all items starting at $1, bidders from across the world find that there’s always something new to discover at www.EBTH.com. Check out these two amazing local sales (and many others on EBTH) and let me know if you find a treasure!! This post was brought to you by Everything But The House. While I did receive compensation for authoring this post; product selections, descriptions, and opinions are 100% my own. Interested in a sponsored post or product review? Contact me for rates and details.